The world's only solar-powered aircraft 'Solar Impulse-2' is all set to fly to Varanasi Wednesday after a week's stop over in the city as part of its round-the-world trip. "Only ten hours left before Solar Impulse-2 take off from Ahmedabad with Andre Borschberg at the controls in Flight three on round-the-world trip with zero fuel," the 'Solar Impulse-2' (SI-2) team tweeted Tuesday. According to a press statement issued by the SI-2 team, the 'no-fuel', purely solar-powered aircraft is set to take off from the city at around 5.30 am. Earlier, the SI-2 team had postponed departure from its scheduled date on March 15 due to bad weather conditions. Later, it was scheduled for departure on March 17, which was extended by one more day until March 18. The globe-trotting SI-2 landed at the Sardar Vallabhai Patel International Airport here on March 10, around 15 hours after it took off from Muscat. Andre Borschberg, the project's co-founder and pilot, besides its co-pilot as well as president Bertrand Piccard have spent more than a week in the city. The aircraft began its journey on March 9 from Abu Dhabi. 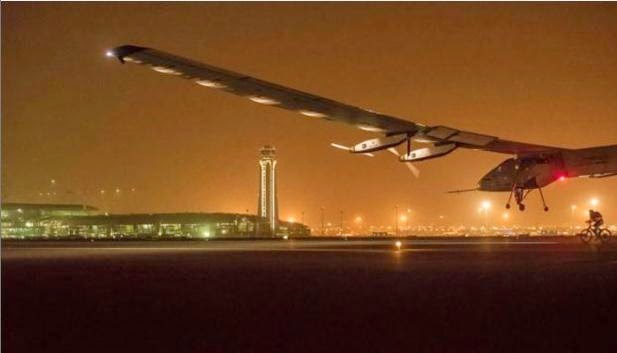 Swiss pilot Bertrand Piccard had flown the plane from Muscat to Ahmedabad, while his co-pilot Borschbergh will fly the solar-powered aircraft to Varanasi. From Varanasi, the SI-2 is scheduled to fly to Mandalay in Myanmar, Chongqing and Nanjing in China and thereafter to the USA.